The bicycle ride from the neighborhood bordering Hazard Park and the USC Health Sciences campus to Highland Park is grueling. A stack of 50 tabloid-sized, 28-page newsprint magazines packed into a worn canvas shoulder bag gets heavier than you might expect once you’ve crossed through Lincoln Heights and cut over the 110 Freeway on Pasadena Ave. to Figueroa and Avenue 39. From there, it’s an uphill climb all the way to Eagle Rock, and the prospect of my first real acupuncture session loses a bit of its luster. The restless, fitful few hours of slumber just before daybreak—and the optimistic decision to make the trip astride the seat of a used but sturdy 21-speed trail bike—bear down on me just as heavily as the midday sun. Recalling how I came by the two-wheeled transport, an early model issued by a UK-based performance bike maker, for a fraction of its original cost from the back of a pick-up does little to ease the unanticipated exertion. Even ruminations on the barrio trader who sold me the bike, a colorful old-school veterano and Vietnam vet with a keen eye for quality merchandise left behind by estate heirs and eviction victims alike, are little comfort. As I pedal steadily toward my date with a sheath of long, thin needles, the sweat and sleep deprivation conspire to compromise my will. I’ll just slog on until I break through the wall, I think to myself, anticipating a drastically less challenging but still upward grade that begins at Ave. 52. 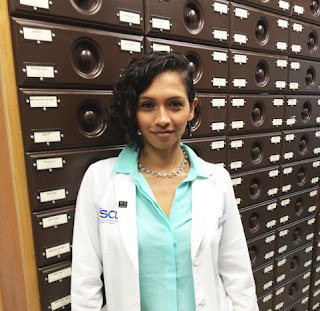 Zelina Medina, an acupuncturist and healer with life-long ties to the East Side arts community is waiting for me at the treatment center she’s opened on Ave. 59 as an extension of AcuVida, as her private practice is known. Outside of what I’ve read, all I know about acupuncture is limited to a brief visit alongside my younger brother and an old friend to a community acupuncture clinic located in a Central Texas strip mall. After filling out intake forms there, we’d been led to a carpeted room, seated in recliners and told to keep our conversation to a minimum. The resident acupuncturist had entered moments later to lodge several needles into the backs of our hands, our wrists, elbows and ankles, leaving us to relax and meditate for about 45 minutes. Afterwards, I’d climbed into the passenger seat of my brother’s truck, wondering why so many people swore by acupuncture as a powerful alternative to big pharma and corporate medical care. Driving into a parking lot across the street, my brother maneuvered us into a space five steps from the entrance to the neon-lit Mexican restaurant where a pair of friends awaited our arrival. In the time it takes to say “Olé,” our table was strewn with nachos, fajitas, chips, queso, guacamole and a round of margaritas. So much for healthy, holistic alternatives to western medicine. Nearly an hour late for my appointment with Medina, my t-shirt wet from perspiration, I walk the bike inside the storefront foyer and waiting room. Medina’s door is on the north side of the street less than a block from Figueroa toward the Highland Park Metro Gold Line stop. Medina’s practice is conveniently—or dangerously—close to La Monarca, a trendy Latino-owned bakery and coffee shop. It dawns on me that I should have ridden to the 26th St. Gold Line Metro station in Cypress Park and boarded the train with my bike as I guzzle several cups of water from a dispenser. I am struck simultaneously by the palpable serenity that pervades the multi-purpose facility which has been divided into several enclosed rooms of various sizes, the largest providing space for martial arts instruction. A licensed practitioner with a Master’s in Acupuncture and Eastern Medicine, Medina hands me her laptop which is open to an online-based intake survey. Her voice is gentle, and her smile—framed by a finely chiseled face—is warm. Despite the white medical coat she wears, Medina is down to earth as she explains that my answers to the seemingly endless barrage of survey questions on lifestyle and health issues might help her diagnose and treat maladies I might not even know I have. Walking me to a small examination room with a massage table, Medina asks me to remove my shirt and shoes and socks, instructing me to lie face down on its narrow, padded surface. A long sheet of hygienic paper separates my bare skin from the leather upholstery. I rest my face in an oval-shaped opening on one end, a feature that positions the spinal column along a true level. The needles are inserted along nerve, circulatory and synaptic matrices Medina became familiar with while exploring homeopathic treatments after she was diagnosed with Lupus in May of 2007. Extremely debilitating and incurable, the disease is characterized, she informs me, by auto-immunities that turn on the body’s own often critical cells and tissues. The body, when afflicted by Lupus—or “wolf” in Latin—essentially begins eating itself. Medina anchors the epidermal needles based on an intricate mapping of pressure points associated with muscular and neurological systems. The pressure points comprise a network of tiny “reset” buttons used in acupuncture to readjust and realign important cellular, biological and physiological functions. The needles are distributed according to my identification of minor and occasionally not so minor muscle and joint pain as well as her own knowledge and medical training. My left rotator cuff—the link between your arm and shoulder socket—might have been torn, I tell her, during a fall from midway down a ladder attached to the frame suspending my bed six-feet above the ground. Stubbornly, I’d opted to protect the cell phone held close to my ear just before the spill. Instead of dropping the phone and using my arms and hands to brace myself, I’d held the phone aloft to keep from losing the connection or worse, wrecking the phone itself. “I took the fall entirely on the corner of my left shoulder,” I say to her with chagrin. I also sensibly refrain from describing how the voice on the other end of the telephone—a soft, slightly hoarse contralto unique to a very cool woman I’d fallen completely and irredeemably for—had been busy letting me know she no longer loved me and really needed me to let her go. What I didn’t know, was that, despite citing concern for an ailing, elderly father, she would be spending that same night with a new love interest. So while getting my heart slightly broken, I’d also managed to injure myself. That the pain, the one in my shoulder, was still occasionally an issue despite having dwindled over time, was proof, Medina suggests, of permanent, long-term damage. I listen serenely and notice the therapeutic effects of the skillfully applied needles already kicking in. I’d been scarcely aware of where and when the needles had been inserted and begin to feel I’m floating with an odd, inexplicable weightlessness. Medina gently excuses herself as the acupuncture treatment takes its course. I lie there awash in a low-res euphoria, suddenly and unexpectedly sensing the presence of my mom. It’s almost as if she’s come to watch over me and is pleased to see me there. At 44, long after delivering seven children into the world, my mother had boldly ventured out on her own to earn an associate’s degree as a nurse, realizing one of her life-long dreams in the process. Claimed by cancer at 69 almost ten years ago, this is only the third time her fierce and protective hummingbird spirit has returned to express approval. The newly met healer returns, asking me to roll over onto my back after removing the needles she’d peppered it with earlier. With my eyes still closed, I’m hovering in a space that is at once tranquil and alert, conscious of fresh needles being applied to my forehead and across my upper body. The acupuncturist leaves the room. An eternity or maybe only minutes transpire, and I see myself suspended by a net of thin filaments that appears to be the result of electrical impulses moving back and forth along patterns created by lines radiating outward from each needle. Rousing me from the drift toward sleep and the lucid vision, Medina arrives to remove the second set of needles and conclude my first real acupuncture experience. In the conversation that follows, Medina says she was born in Bell Gardens, but came to Highland Park with her parents while still in diapers. “I was actually the president of my senior class at Franklin,” she says grinning. Her childhood, she says, was defined by a desire to study dance, drama and music. “I took every class offered at Plaza de la Raza,” she continues. “Dance is powerful. I grew up being a dancer.” At Plaza, she studied “folklorico, jazz, ballet, hip-hop, guitar and voice.” She is pleased to note, with a luminous smile, that she is still in touch with Irma “Cui-cui” Rangel, the vocal coach she studied under at Plaza and a beloved mentor who recently helped host a party in her honor. She was inspired and riveted most, Medina emphasizes, by a book she encountered during her search for information and guidance with respect to her struggle to defy the prognosis that came with her condition. The book, Lupus: Alternative Therapies That Work was penned by a woman with Lupus who had been treating herself successfully for years. Reading it changed her life “literally from one day to the next,” Medina asserts. 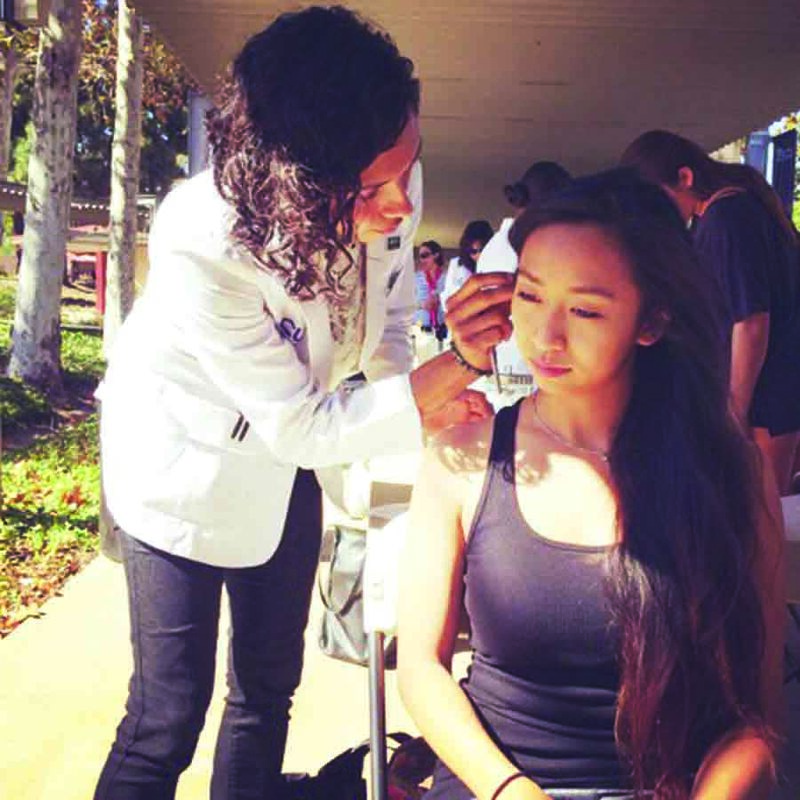 Once she’d begun getting acupuncture treatments, it wasn’t long before her lab results were showing much lower levels of things related to Lupus, says Medina. Encouraged, she undertook the formal study of acupuncture. Although it took her a full eight years to complete a Master’s Degree and get licensed by the state to treat patients, Medina is ready, and her door is open. She is just as excited to announce that she has been accepted into a doctoral program in acupuncture as well. 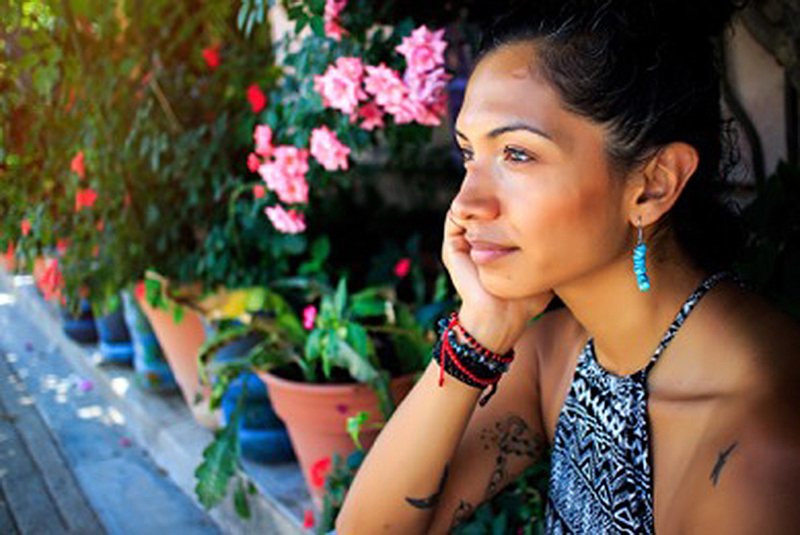 Medina aspires to develop a cross-cultural health alternative that combines the practice of curanderismo and indigenous healing traditions, which are her legacy as a mestiza, with Eastern medicine and her acupuncture practice. Motivated by that mandate, she traveled to Oaxaca not long ago to study under the legendary Doña Enriqueta Contreras, a Zapoteca healer, midwife and “yerbera” who teaches hand-selected apprentices the philosophy behind her success as a powerful medicine woman, the role of the “temascal” and her knowledge of medicinal plants. She is also reaching back to research Mayan medicine in hopes of creating a syncretic fusion of indigenous healing practices and Eastern modes in hopes that it will lead to similar collaborative experiments in the field. For the bronze-skinned daughter of Mexican-born parents who straddles a universe of languages and cultural expression and who is now fully committed to the art of healing, those “sueños” ring truer when she helps others become healthier, happier, stronger and more whole. “I feel like I was chosen to be on this path,” Medina says simply. Seated across a table from her over an afternoon meal following the treatment, I attempt to recall the lingering soreness in my shoulder. The dull muscle pain and decreased range of comfortable motion in my arm have receded significantly. The cell phone conversation that coincided with the injury has likewise been retired to the shelf shared with once awkward emotional and physical triggers. There it morphs slowly into a distant—if a bit melancholy—memory The recollection, in the interest of full disclosure, was laced from the start with a measure of sweetness and passion and poetry, even at its most poignant. In the aftermath of acupuncture, it takes on the dimensions of a pleasantly recurring dream, one that has outlived its past to serve as a compass by which to navigate the future. Without magazines, delivered on the short route from Acuvida to the post-treatment lunch with Medina, the journey homeward is punctuated by the air whipping past my face and through my hair. With the grade of the hill and gravity now in my favor, the downward bike ride to Big Hazard is not only easy, it is positively exhilarating.